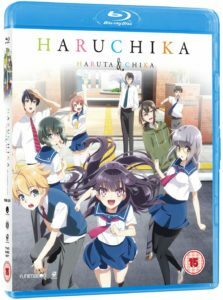 A selection of anime titles from US based distributor Funimation Entertainment are set to be released in the United Kingdom this year via distributor Anime Limited, the Glasgow-based distributor confirmed at their MCM London Comic Con panel today, following an investigation by Anime UK News. Shomin Sample (26 November 2018). Having distributed Funimation Entertainment titles in the UK in the past, Anime Limited previously announced Chaos Dragon, Dagashi Kashi and Shomin Sample for release, although the company later cancelled the releases following Sony Pictures acquisition of Funimation Entertainment in October 2018. Since then, Funimation Entertainment titles like Attack On Titan, My Hero Academia and Yuri!!! on ICE have been released by Sony Pictures Home Entertainment. With the exception of the Blu-ray only Shomin Sample, all mentioned titles will have individual Blu-ray and DVD releases. This is contrary to the recent release format of Funimation titles distributed by Sony Pictures Home Entertainment, who moved to combo-packs starting with Black Clover Season 1 Part 1. Additionally, the Blu-ray only release of Shomin Sample reflects an announcement made by Anime Limited in April 2017, noting that they planned to release it on that format only, owing for a licensor request for DVDs to be PAL encoded. This follows last week’s news that the British Board of Film Classification refused an 18 certificate for Valkyrie Drive: Mermaid, another title commonly associated with Funimation Entertainment. We reached out to the BBFC, who confirmed that their ruling was for a DVD release only, and would have had no legal bearing on its availability via SVOD services, meaning its removal from Funimation Now’s UK catalogue was likely done as a preventative measure, rather than out of legal obligation. Responding to a request for comment from our earlier investigation, Anime Limited confirmed with Anime UK News that the titles are from their previous distribution arrangement with Funimation Entertainment, and at time of publication, are not indicative of future Funimation anime titles.